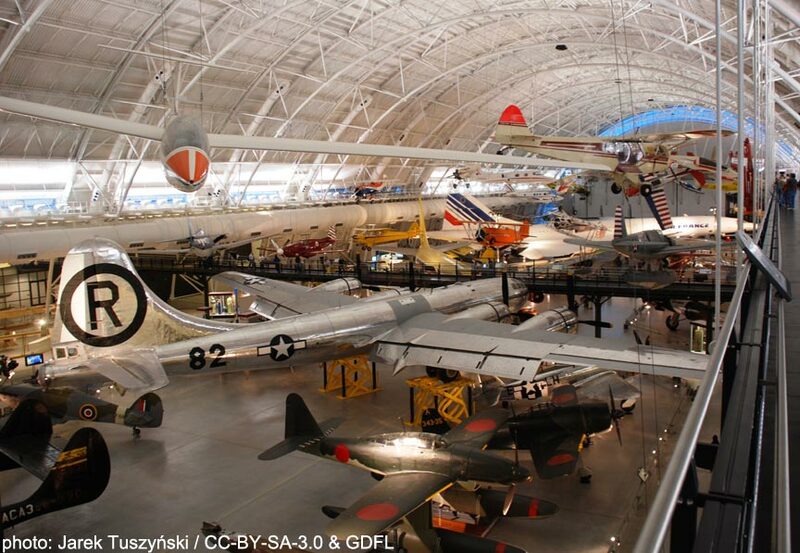 Did you know that the Smithsonian National Air and Space Museum has an annex in Virginia that displays, among other things, the Space Shuttle Discovery and the Enola Gay? It's true. Don't believe me? Visit the Steven F. Udvar-Hazy Center and see for yourself! If you're an aviation enthusiast, you'll love the Steven F. Udvar-Hazy Center in Chantilly, VA. The center is the companion facility to the Smithsonian National Air and Space Museum in Washington, DC. The two facilities receive more than 8 million visits per year, making them the most popular museum in the United States. With its low profile and star-studded collection, however, some say the Udvar-Hazy Center is even better than the big museum on the National Mall! The Udvar-Hazy Center has numerous exhibits and two hangars just bursting with aviation history. The first thing to catch your eye will be all the aircraft and spacecraft hanging overhead. As I mentioned at the top, the Udvar-Hazy Center is the current home for both the Space Shuttle Discovery and the Enola Gay. The Discovery flew nearly 40 missions during it's 27 years of service, more spaceflights than any other spacecraft to date. The Enola Gay, of course, is the infamous Boeing B-29 Superfortress that dropped the first atomic bomb on Hiroshima, in 1945. These aren't the only air or spacecraft of note at the center, however. You'll find a cornucopia of vehicles, including the Gemini 7 space capsule, a Lockheed SR-71 Blackbird, a Concorde supersonic airliner, and a Curtiss P-40E Kittyhawk. And that's just the beginning. The list of aircraft and related items is huge. There are helicopters, space suits, and experimental aircraft. The even have a piece of fabric from the Hindenburg! The Udvar-Hazy Center contains thousands of fascinating artifacts and interactive exhibits. There is also an IMAX Theater and simulators that can show you what it’s like to fly a fighter jet or walk in space. The Donald D. Engen Observation Tower will give you a 360-degree, bird’s eye view of the surrounding area. Watch as planes take off and land at Dulles International Airport. You can tour the facility at your own pace or join one of the museum's free daily tours, led by aviation experts. Many of the museum’s docents are retired pilots and aviation specialists. They'll be more than happy to answer your questions. Visit the airandspace.si.edu website for more information on the Steven F. Udvar-Hazy Center. No matter where you go in Virginia, you can bet there's a Virginia B&B somewhere nearby with a bed turned down just for you. Enjoy amazing amenities, nutritious breakfasts, and an insider's knowledge of the area when you stay at a Virginia inn. Find an Virginia Bed and Breakfast near your destination, today!